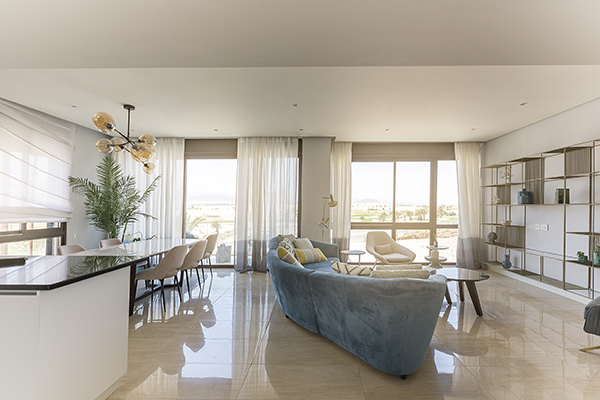 The first show apartments in the Golf Residences project are now open to visitors. The residences comprise of cluster buildings housing 1, 2 and 3 bedroom apartments. The clusters have a stepped form allowing for private terraces for each apartment, while louvered screens provide shade and privacy, while contemporizing traditional design. The open air lobbies are designed to feel like an extension of the outdoor landscape through the continuation of warm desert tones of the exterior context. The floor and staircase are finished in exposed aggregate concrete as a continuation of the landscape paths and materiality. A tessellated sequence of aluminium screens provide shading and security to the lobby, tying into the screens sheltering the apartment windows. 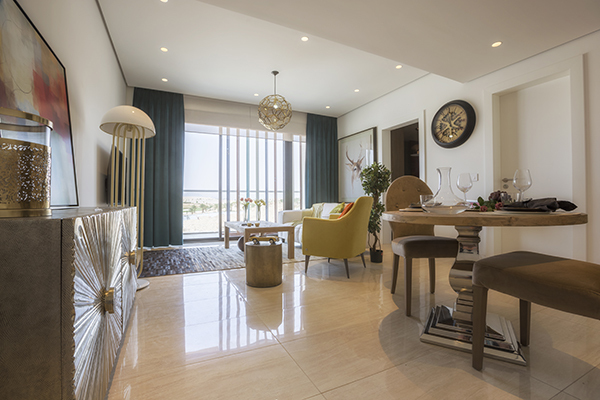 The apartment interiors are open plan with a warm material palette following the earthy tones of the building. They have been carefully designed in order to achieve an efficient and compact layout.